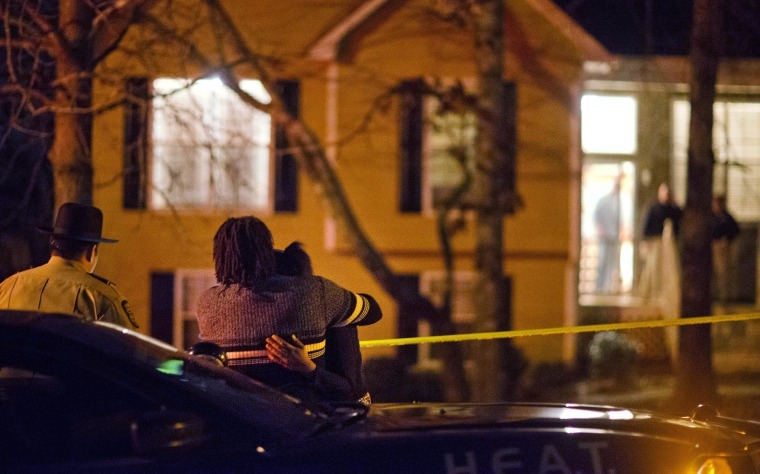 A gunman killed at least four people and himself at a home west of Atlanta on Saturday, authorities said. At least one of the dead is a child, according to the Douglas County Sheriff’s Office said. Authorities received a 911 call of shots fired at a home on Willow Tree Circle in a housing division in Douglas County, about 20 miles west of downtown Atlanta, at around 3 p.m. Saturday, Douglas County sheriff’s Lt. Glenn Daniel said. When deputies arrived they found multiple people shot outside and inside the home, he said, adding that seven people were shot in total. Five died. "We know it's domestic-related at this point," Daniel said, adding that the gunman — an adult male — shot himself. He said the victims' ages range from 7 years old to adults and that least one of the dead was a child. Two juveniles survived gunshots and were being treated at a local hospital, Daniel said. Neighbor Andrews Ansah told NBC station WXIA that the youngest children in the home are 7 and 8 years old, and were playmates of his own Ansah's own children. "We just had the little girl and boy over yesterday. My son and daughter are their same ages," Ansah told the station.The identities and ages of the victims were not immediately released. "This is a tough situation. Any time you have children involved in a shooting or anything like that, or children hurt at all, it's just tough. ... It tears on your heart," Daniel told reporters outside the scene. "It just don't make no sense."